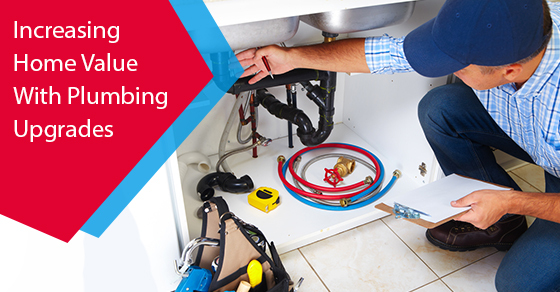 There are a number of plumbing upgrades that you can take on to improve your home’s value. Keep in mind that there are many upgrades that do not add value to your home and in some cases could even reduce the value of your home. However, here are four plumbing upgrades you can feel comfortable investing in. Are you looking to increase the value of your home without a lot of work or cost involved? Updating your plumbing fixtures, such as your bathroom tap, can add additional value while also improving your bathroom’s appearance. Although this is not a plumbing upgrade, a fresh coat of paint can also increase your home’s value. If part of your plumbing system does not meet current codes or is in need or repairs, you can drastically decrease your home’s value. Not only will this reduce the value of your home, but it will also make potential buyers think twice before buying your house. Do you have rusty iron pipes? If your house is older, it is very possible that you have less than ideal pipes. You may be surprised to find out just how much an appraiser will take the type of plumbing you have into consideration when assessing your home’s value. In addition to repairing and upgrading your plumbing, your air conditioning and water heater are additional systems in your home that need to be in good working order to ensure that you can receive the best possible price for your home. In short, if your home is put in the “fixer-upper” category, its market price will ultimately be compromised. If you are looking for a more extensive project that will significantly increase your home’s value, adding another bathroom is one way to accomplish this task. A full bathroom could potentially increase the value of your home by 20%, while adding even a half-bath could increase it by up to 10.5%. According to HGTV, you will get back anywhere from 80% to 130% of your investment. If you don’t believe you have the space to add another bathroom, don’t forget to consider less common spaces, such as closets or the space under a set of stairs. Whether you are in need of plumbing or water services to increase the value of your home, contact our team of experts at Brothers Plumbing today. We have over 50 years in the industry and offer affordable rates.